Another day, another Instagram beauty brand find! Miriam Quevedo’s passion for cosmetics blended with her husband’s 35-years of developmental laboratory research experience led to the brainchild that is my new favorite hair AND skincare brand. Their mission was to combine her knowledge of the most precious and rare active ingredients with the laboratory’s state-of-the-art, scientific innovations. Made with high concentrations of the world’s finest ingredients in Barcelona, each luxurious essential is a product of Miriam’s decades of experience as a true hair and skin care master. From rejuvenating hair treatments to customized skin rituals, the line transcends modern cosmetic standards. Sourcing and utilizing the world’s most precious ingredients, organic botanical blends and high-tech peptides, Miriam Quevedo offers both the beauty of luxury and the beauty of science. Revolutionary biotechnology fuses antioxidants with proteins, peptides and amino acids to create advanced delivery systems that turn back the hands of time. Face – The second step in my morning and night skincare routine, following cleansing is the Black Baccara Global Revitalizing Toner, which uses calming botanical extracts including, Blue and White Lotus Flower Extract, Elder Flower Water and Chamomile Floral Water, purify, refresh and balance the skin. Unlike many toners I’ve previously tried, my skin isn’t left feeling dry and it is instead smooth and prepped for the rest of my routine and/or makeup. 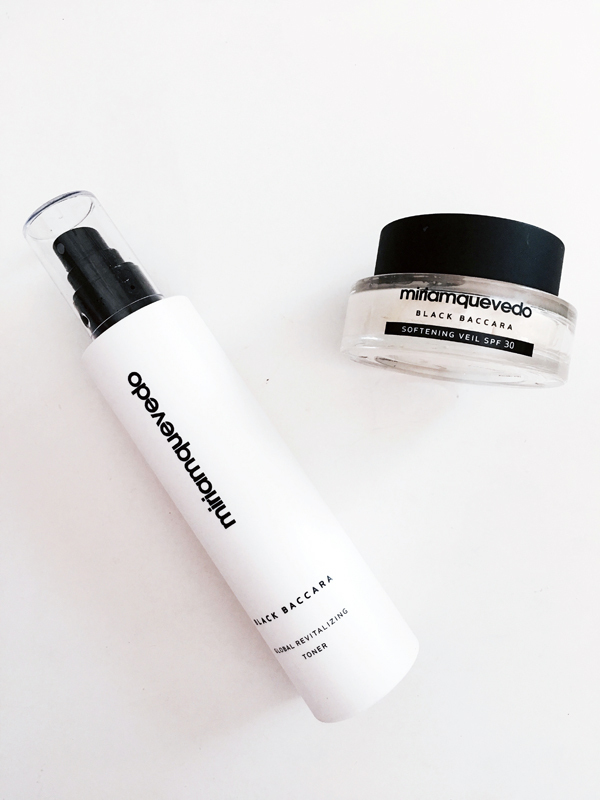 A second skincare product in Miriam Quevedo’s line that intrigued me was the Black Baccara Softening Veil with SPF 30. At first I was not sure what is was exactly, but upon closer research and now daily use, I can’t image my morning routine without it. The last step to my morning ritual, it seals in your treatments and leaves skin looking flawless and ready for makeup (or not!). Hair – From Extreme Caviar to Sublime Gold and Platinum & Diamonds, it might be hard to choose which luxury to indulge in. My personal favorite is currently the Glacial White Caviar Resort collection for hair and scalps that are exposed to excess sun, wind, salt & chlorinated water. 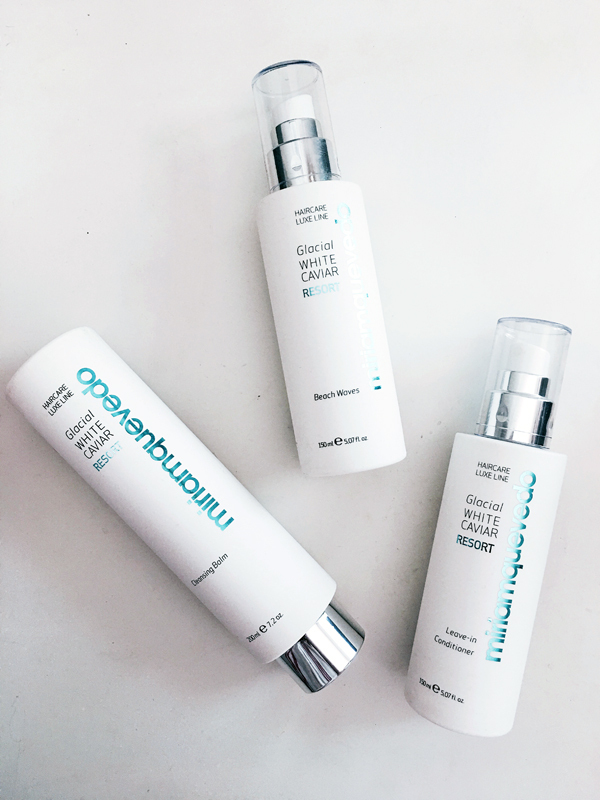 For any woman hitting the pool or beach this summer, the Glacial White Caviar Resort line is ultra-hydrating and protects using white caviar, encapsulated glacial water, and sea foam. Start with the cleansing balm for an ultra-lavish shampoo that delicately removes residue and impurities, offering anti-aging benefits while protecting the hair and scalp from the elements. Follow the cleansing balm with the leave-in conditioner to detangle, eliminate frizz and protect against heat and color fading. Finally, if you want a natural lived-in beach look, use the Caviar Resort Beach Waves texturizing spray formulated with sea foam for a sultry look. This ultra-lightweight formula fortifies with precious oils and a cocktail of potent antioxidants, proteins, peptides and amino acids to help erase the signs of aging while addressing the specific needs of elemental stress.